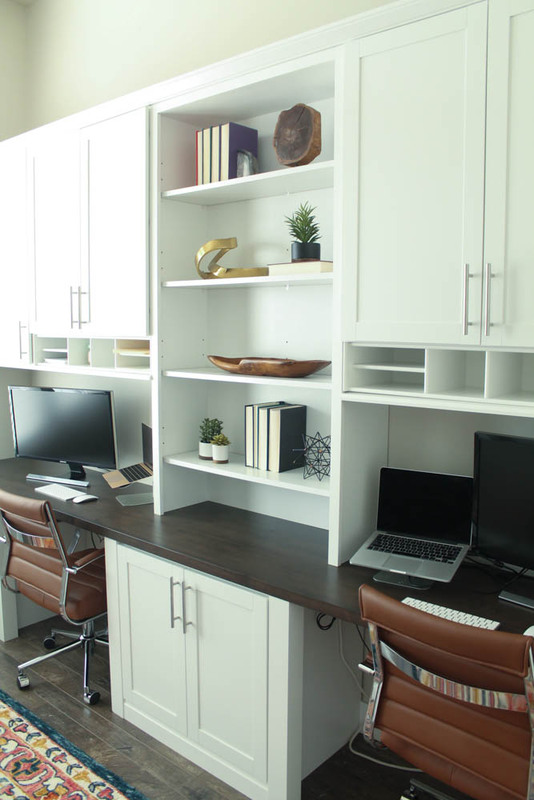 We are so excited to finally show you our home office! But before we begin….I will take you back to what our home office looked like before. When I posted this picture on social media, a lot of people mentioned that it wasn’t bad before. But if you only knew! It was so unorganized, the carpet was so matted under our chairs and we didn’t have any storage. My husband and I both work from home, so being in this cramped, messy room all day made me a little crazy! Which brings me to this corner of chaos. I have photography equipment for our blog, regular office supplies, important documents and all of my husband’s work papers and files shoved in here! We had very little storage in our office, so regular office supplies had to be out on the desktop. I knew that we had to have some drawers and cupboards to store everything in to free up some much needed working space! 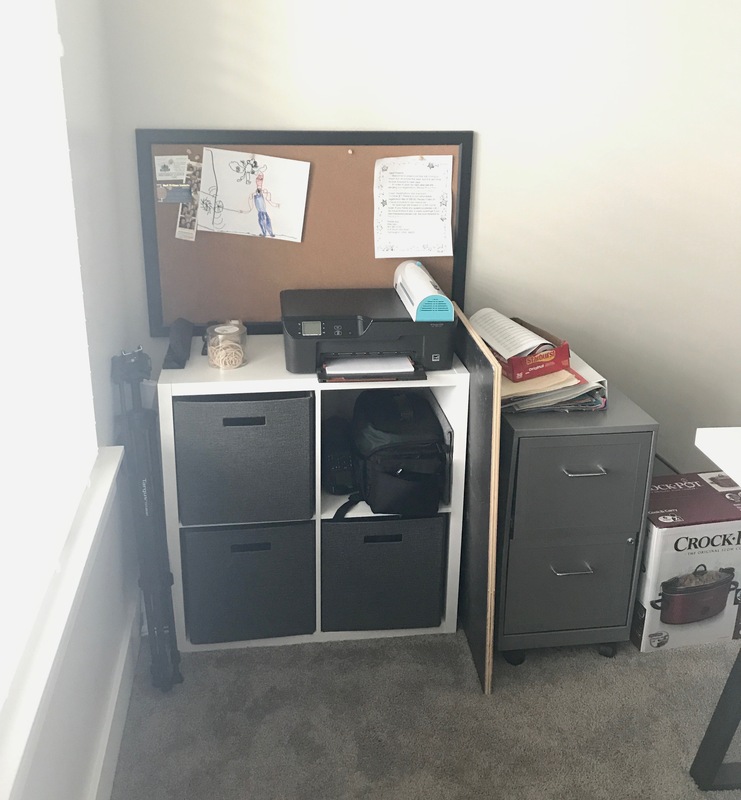 My husband and I were always planning on improving our home office, but it was one of those projects we never got around to until we had to. 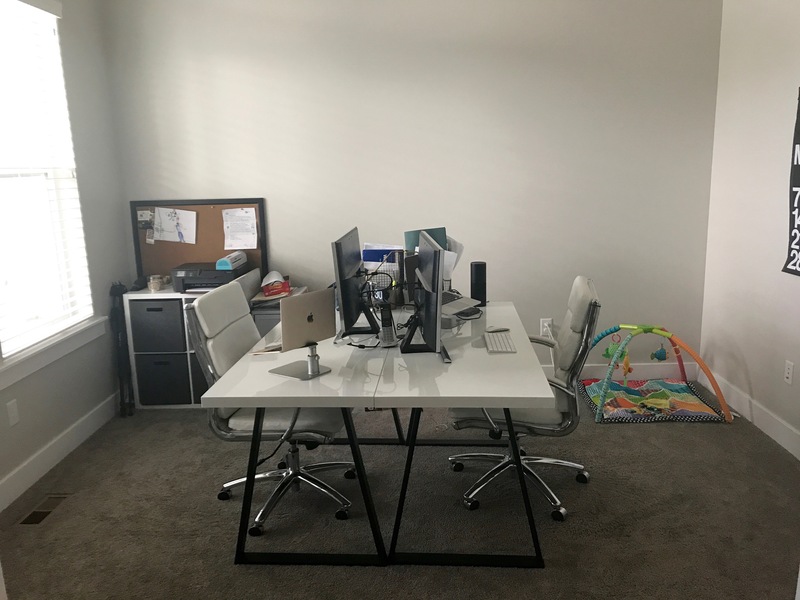 My husband worked at a nearby office, but over the last two years had started working from home which made things crowded and a little crazy in this room! With both of us running businesses from our home office, we knew we needed to create a more functional space. We did plenty of research to find the most affordable and high quality cabinets for our office, which lead us to Aristokraft Cabinets! I worked with Artistokraft Cabinets to help design the whole office. 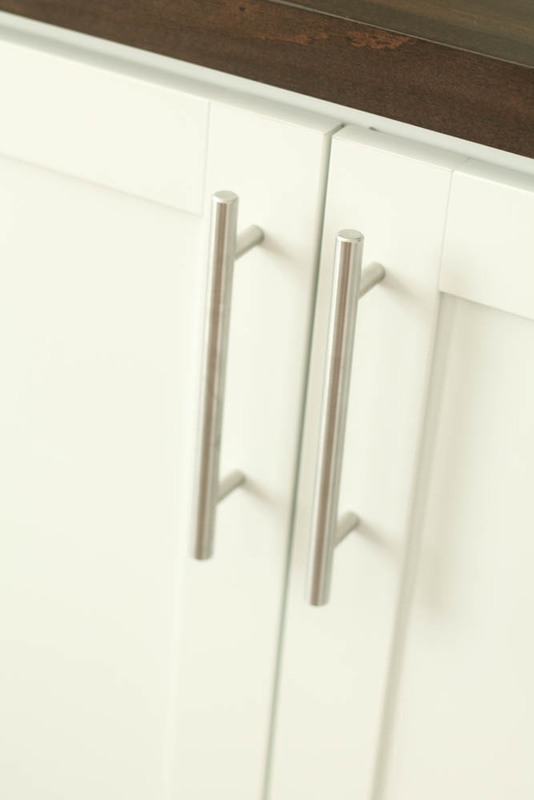 Aristokraft offers a huge variety of cabinetry that is affordable, beautiful and functional at the same time. They made the whole process so easy and can help you create the exact look you are going for on your next cabinetry project! I told them some of the needs and wants I had for our home office and they came up with this amazing set up! 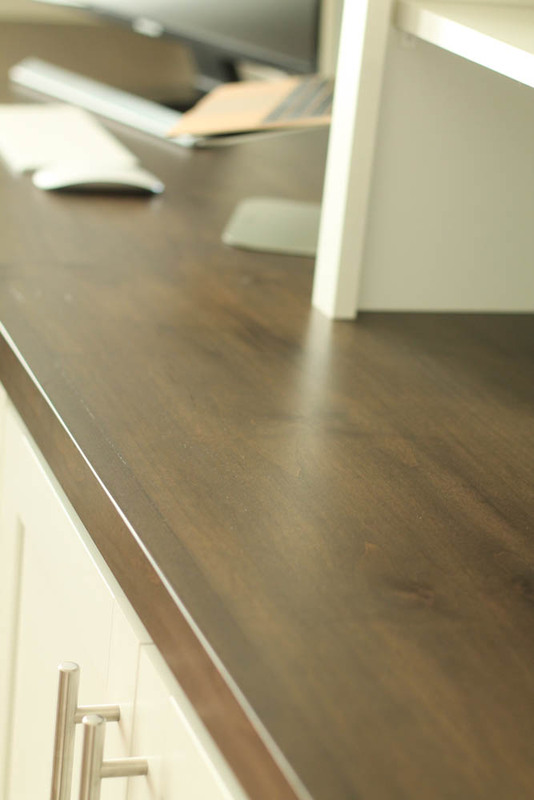 You can read more about our home office design inspiration HERE. We started our office makeover by removing all of the old carpet from the room. We have Fluent Floors Laminate Flooring installed throughout the main level of our home and absolutely love it. It made sense to just continue it into the office! The flooring I have installed is the Fluent Floors Laminate Flooring Farmhouse 101. 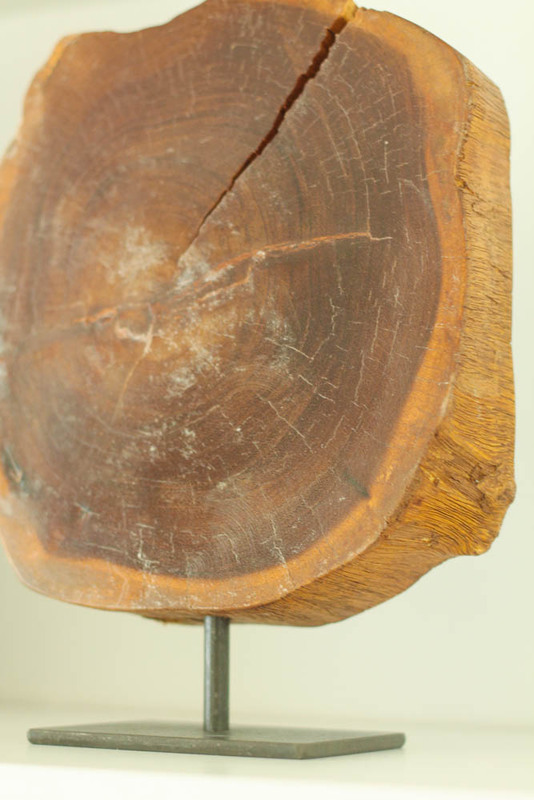 It is the perfect combination of warmer and cooler tones and looks and feels like real hardwood! You can also find Fluent Floors other laminate flooring options HERE. After the flooring was installed, it was time to install our cabinetry! 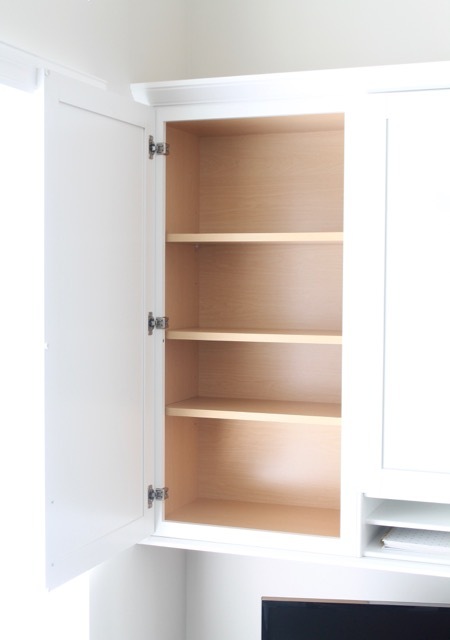 The cabinetry we chose is the Aristokraft Brellin PureStyle in White. 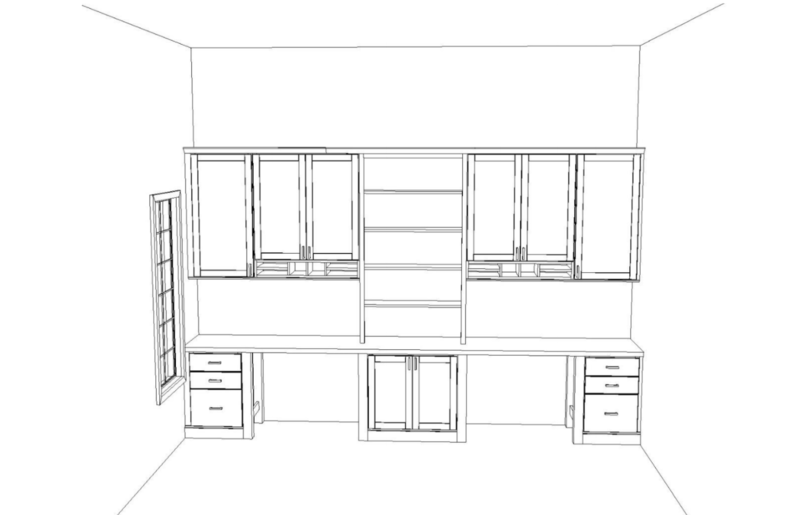 Having the cabinetry and built-in desks on one wall completely opened up the whole room. It also created more storage that we even know what to do with! 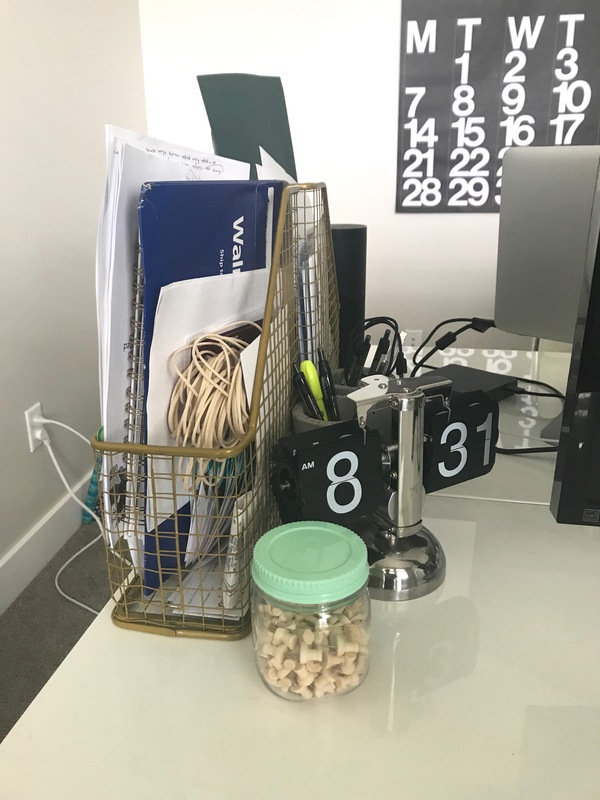 I love having cabinets above our desks to store larger office supplies. 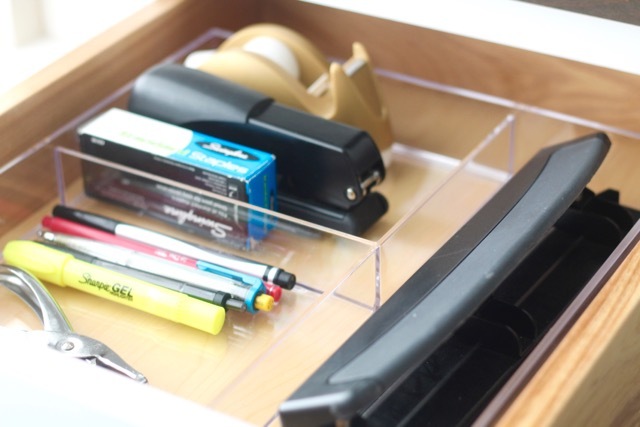 I couldn’t be happier to finally have some drawers to store our smaller office supplies! It is so nice to not have all of these things out on my desktop! 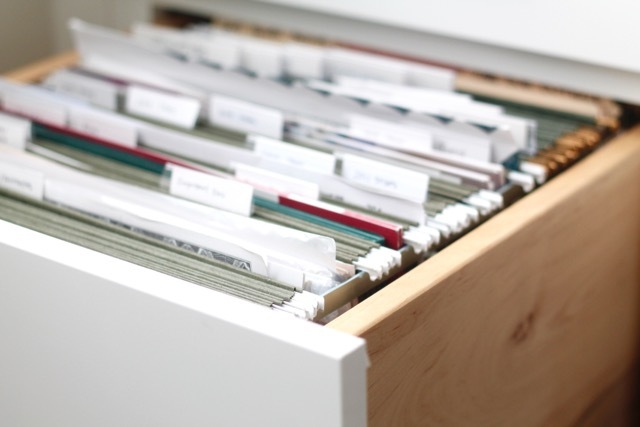 We were able to get rid of our filing cabinet all together because of this file cabinet drawer. 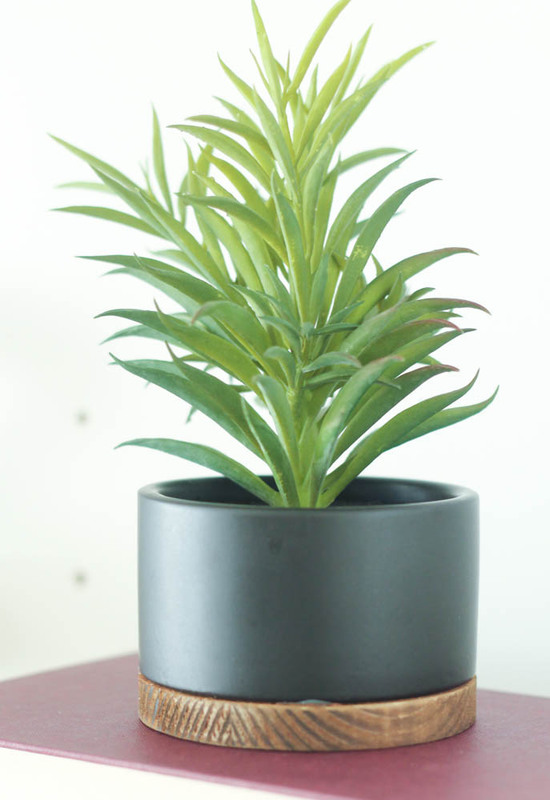 You can read more about how we’ve organized our home office HERE. We were originally going to install some quartz countertops, but we were able to save quite a bit of money by having a butcher block desktop made. We found a local wood worker who cut and stained the countertop for us. I love how it turned out and it has held up really nicely! I always hated the mess of cords to our computers and other things in our office before. 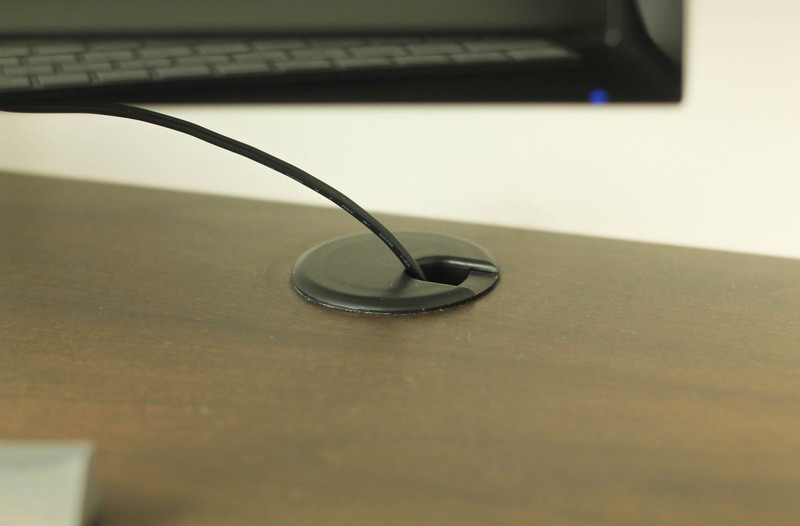 My husband drilled some holes and inserted these grommets so we could run our cords down through the desktop. We also attached some power strips to the underside of our desks so everything could be plugged in with very few cords showing or getting tangled. My husband also added some hardware to the cabinetry that matched the hardware we have in the rest of our home. I wanted something really clean and simple, and this does the trick! After the cabinetry was in, it was time to decorate! 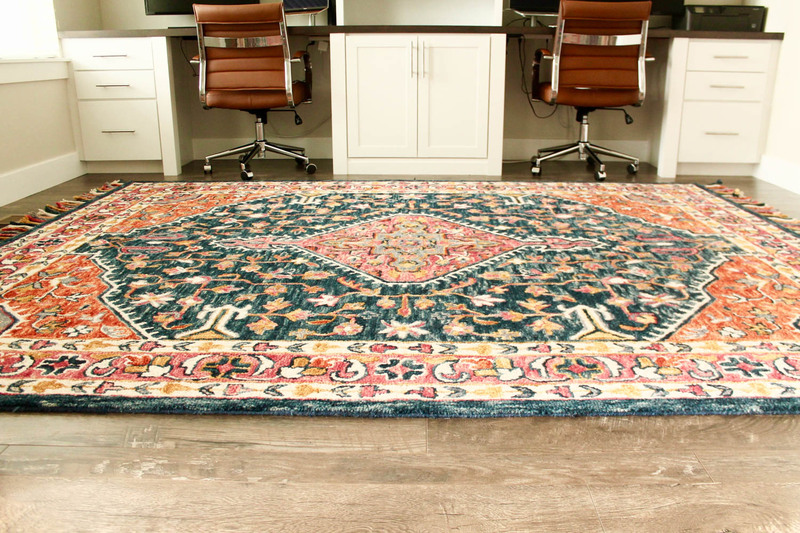 As soon as I saw this rug from Loloi Rugs, I knew I needed it for our home office. This rug is part of the Zharah Collection and is made of 100% wool. 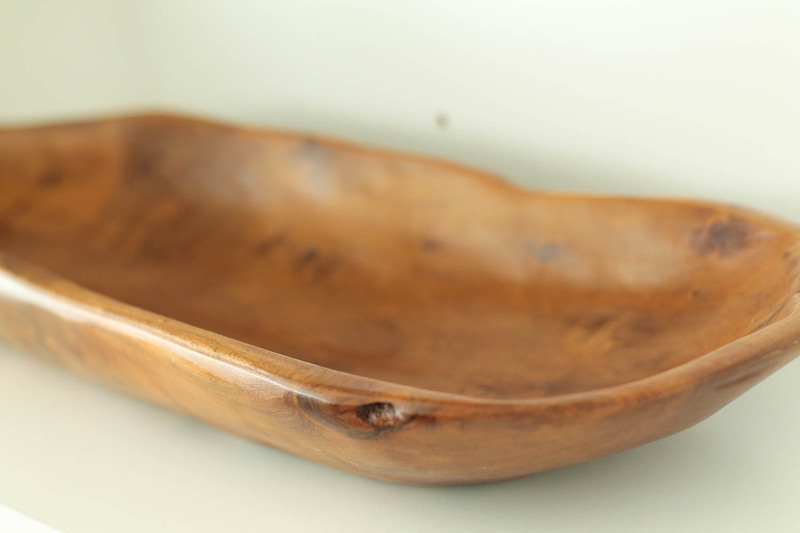 It is such high quality and brings some warmth and texture into the room. Our old office chairs had been drawn on with permanent marker by a toddler and were getting pretty worn. I found these chairs on Amazon for an awesome price and we have loved them! 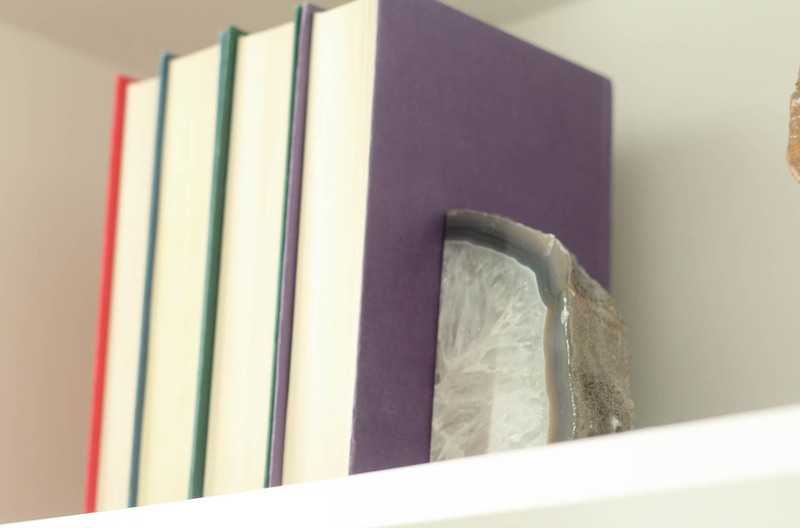 I love the gorgeous bookshelves that Aristokraft suggested we include in our office. 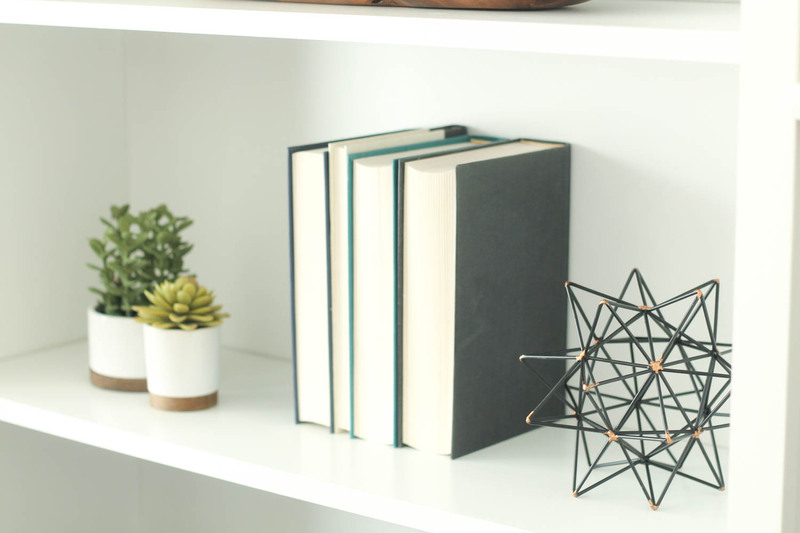 I love having a place to store some of my favorite books and some decor to bring some life into our office! I think that about covers it! 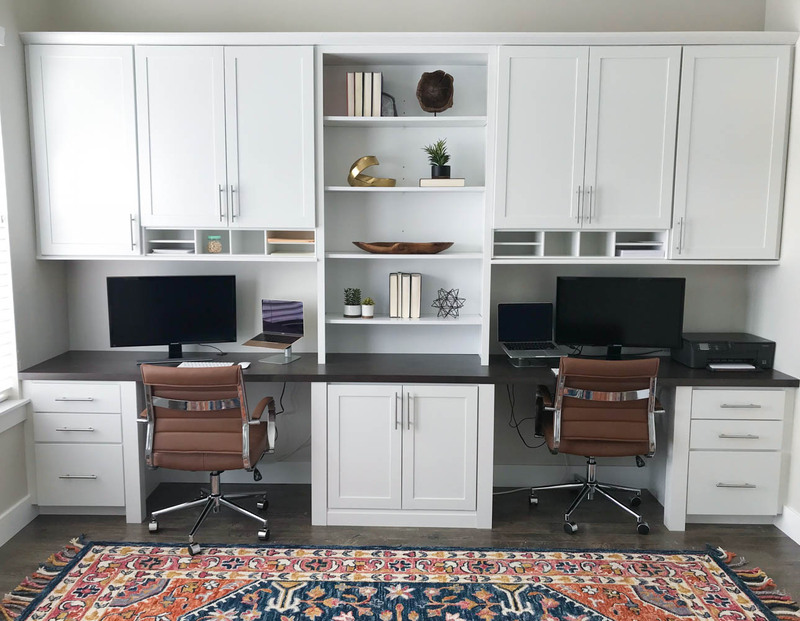 We couldn’t be happier how our home office turned out and these built-ins from Aristokraft Cabinets completely transformed this room! If you are thinking of starting a cabinetry project, check out Aristokraft Cabinetry for amazing quality at an affordable price! 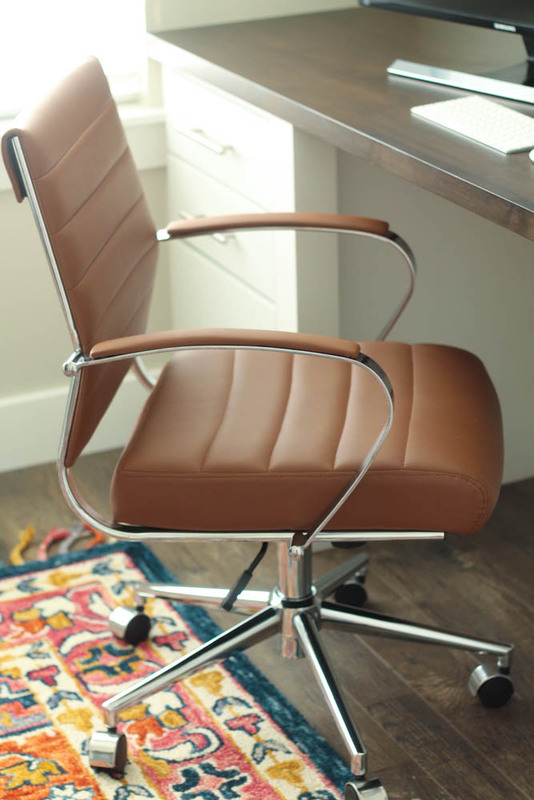 If you have any home office related questions, comment below! Hi there! 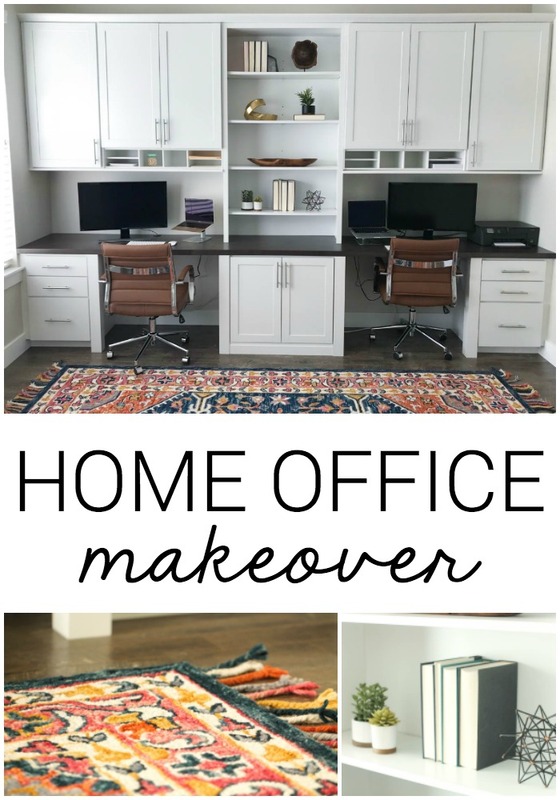 Love what you've done with the home office! It looks awesome! You have stands holding a laptop and what looks to be an ipad. 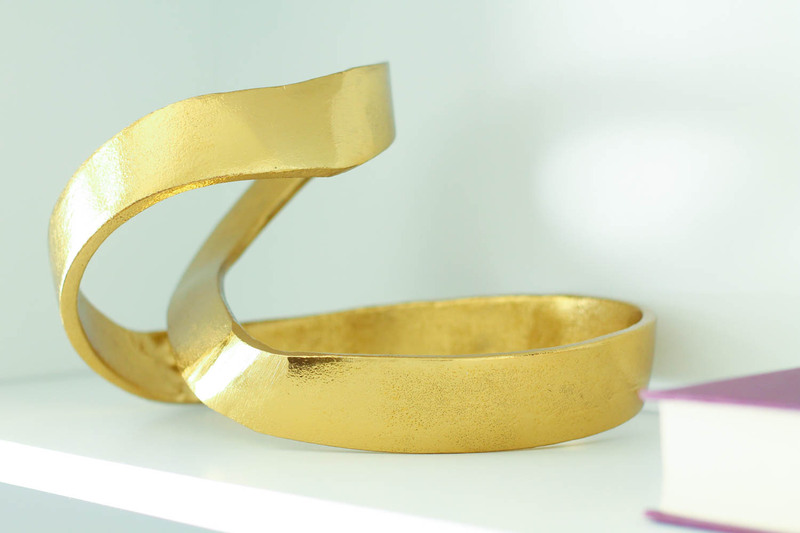 Can you tell me what those are called and where you got them? Thank you so much! Hi Roni! Thanks for your comment! My husband said he found the laptop stands at Best Buy. We use them for my MacBook and his MacBook Pro. I am sure they have something that would work for an iPad. Hopefully that helps!